Prince & Prince Forecast 44 Million U.S. Households To Make Floral Purchases for Valentine's Day 2018. Click HERE for the report. U.S. Consumer Floral Purchasing for Birthday Occasions: An Historical Trend Perspective. Click HERE for the report. Prince & Prince Project a $4.2 Billion Dollar U.S. Consumer Floral Market for Mother's Day 2017. Click HERE for the report. U.S. Consumer Floral Market Projection for Valentine's Day 2017 Holds Steady at $3.3 Billion Dollars. Click HERE for the report. Prince & Prince Release a New Market Report, "The Influence of a Weekend Valentine's Day Holiday on Consumer Floral Purchasing". This report is based on historical analysis of consumer floral purchasing data from the P&P U.S. Consumer Floral Tracking Survey. Click HERE for the report. Prince & Prince (P&P) Project the U.S. Consumer Floral Market for Valentine's Day 2016 at $3.3 Billion Dollars. Market Estimates are Based on Consumer Floral Purchasing Information from the P&P Seminar, "The U.S. Consumer Floral Tracking Survey", Consumer Floral Research Sponsored by Smithers-Oasis, North America (SONA). Click on Release-1-4-16 for more. P&P welcomes comments from the floral industry on this release. Prince & Prince (P&P) Surveys U.S. Wholesale Florists, and Tracks Over 200 Operational, Marketing, Sourcing, and Business Metrics of the Wholesale Florist Sector. Click HERE for the P&P Press Release. Prince & Prince Releases U.S. Consumer Floral Tracking Survey on Flash Drive (2014 Edition) to the Floral Industry. Click HERE for the P&P Press Release. Prince & Prince to Present Selected Highlights of Their Consumer Floral Research at Cultivate'15, An AmericanHort Experience, on Sunday, July12th, 2015. Click HERE for the P&P Press Release. Prince & Prince (P&P) Project the U.S. Consumer Floral Market for Mother's Day 2015 at $3.9 Billion Dollars. Market Estimates are Based on Survey Information from the P&P On-Site Seminar, "The U.S. Consumer Floral Tracking Survey", Research Sponsored by Smithers-Oasis, North America (SONA). Click on Release-4-27-15 for more. P&P welcomes comments from the floral industry on this release. Prince & Prince (P&P) Releases New Report Entitled, "Consumer Perceptions of Floral Quality and Price and Their Impact on Satisfaction/ Purchasing Loyalty: Part I, Consumer Attribute Scores." Click on Consumer Reports for more. P&P welcomes comments from the floral industry on this report. Prince & Prince (P&P) Releases New Report on Recent and Historical Consumer Floral Purchasing Trends for Valentine's Day. . . Market Information from the P&P On-Site Seminar, "The U.S. Consumer Floral Tracking Survey". Click on Market Report-5 for more. P&P welcomes comments from the floral industry on this report. Prince & Prince Presents the 2014 P&P U.S. Consumer Floral Tracking Survey (Half-Day "Highlights" Consumer Seminar Presentation) to a Key Miami Floral Importer During the 2014 WF&FSA Floral Distribution Conference in Doral, Florida. Prince & Prince Takes a Trip to Guatemala City, and Makes a Custom Market Research Presentation on U.S. Tropical Cut Flower Trends to a Guatemalan Cut-Flower Grower. Prince & Prince to Present Updated U.S. Consumer Floral Purchasing Data at Siflor 2014 in Medellin, Colombia in late August. Click HERE for the P&P Press Release. Prince & Prince Releases FULL REPORT on Consumer Floral Usage for Proms & Dances, "U.S. Consumer Floral Purchasing for Proms & Dances Rebounds from Recession". Click on Market Reports-4 for more. P&P welcomes comments from the floral industry on this report. Prince & Prince Release Mini-Report, "U.S. Consumer Floral Purchasing for Proms & Dances Rebounds from Recession". Click on Market Reports-3 for more. P&P welcomes comments from the floral industry on this report. Prince & Prince Release Report on Florist Shop Adoption of Communication Modes as Drivers to Florist Business Success. Click on Market Reports-2 for more. P&P welcomes comments from the floral industry on this report. Prince & Prince Release Report on Florist Adoption of Social Media and Its Impact on Florist Business Success. Click on Market Reports for more. P&P welcomes comments from the floral industry on this report. Prince & Prince Reveal Consumer Floral Purchasing Trends for Valentine’s Day. January 30, 2014 (Columbus, OH). With the recent compilation of the new Prince & Prince U.S. Consumer Floral Tracking Survey, 2014 Edition, P&P is again able to update the floral industry on consumer floral-purchasing trends for various holidays & occasions, including Valentine’s Day, an important “floral holiday” for the industry. Almost half of U.S. floral-buying households (49%) made at least one floral purchase for Valentine’s Day in 2013, which fell on a Thursday (P&P estimates 39 million U.S. households purchased floral). However, this level of floral purchasing was down slightly from the 52% registered in the 2010 P&P survey (and in prior P&P surveys back to year 2000; see prior 2012 P&P report on Valentine’s Day at the P&P web site). Notwithstanding, Valentine’s Day still represents the third highest incidence of consumer floral purchasing across the 24 holidays, events, and occasions measured in the P&P research. Although the number of cupids buying flowers may have been off a bit for 2013, the average dollars spent per household for Valentine’s Day 2013 increased about 9% from 2010 levels. Also on a positive note, floral purchasing for Valentine’s Day 2013 was up for younger-aged consumer segments (households under the age of 35, and those aged 35-44). Yet, on the downside, purchasing was somewhat lower for those aged 45 and older, reversing a long-term, upward, floral-purchasing trend for “elderly romantics” registered over the past decade (see P&P’s 2012 report). On a regional basis, floral purchasing for Valentine’s Day was up in the Northeast region (compared to 2010), steady in the North Central (Midwest) and South Atlantic regions, and down in the South Central and West regions. Rural/country markets and central cities of metro areas witnessed significant declines in incidence of floral purchase for Valentine’s Day in 2013, but city/town markets (pop. of 50,000 or less) and suburbs of metro areas either maintained, or were up slightly in the incidence of floral purchase for this holiday. More salient Valentine’s Day purchasing trends are identified in the updated P&P consumer floral seminar. Gain a keen understanding of the U.S. consumer floral market, where it has been, where it is currently, and where it is likely headed, with the newly released on-site consumer floral seminar from Prince & Prince. In this market information-based seminar, P&P track and analyze over 100 metrics related to what floral products consumers buy, where they buy, when they buy, why they buy, and how much they spend, with trends tracked from 2007 to 2010, and to 2013. In addition, the seminar provides a comprehensive consumer tracking-evaluation of the top eight floral channels where floral purchases are made (30+ evaluation measures), revealing trending strengths and weaknesses of the key floral channels over time (and the implications of those floral channel trends for the industry). For the 2014 update, Smithers-Oasis, N.A. (S-O) was the key sponsor for the P&P U.S. Consumer Floral Tracking Survey, and S-O may request attendance at P&P seminars presented in the 2014 season (S-O covers their costs to attend). Companies, floral associations, and groups interested in booking the one-day (or half-day) on-site consumer floral seminar may contact P&P for seminar options, fees, and scheduling. Please contact P&P for more details. Prince & Prince announces a major on-site floral seminar: The P&P U.S. Consumer Floral Tracking Survey, 2014 Edition. This newly updated on-site floral seminar provides valuable insight on consumer fresh cut flower and indoor potted plant purchasing trends (trends on specific floral products purchased, the holidays, events, and occasions of consumer floral purchase, and consumer dollar spending trends for fresh cut flowers and indoor potted plants). The P&P tracking survey seminar shows market trends from 2007 (prior to the U.S. recession), to 2010 (post-recession), and to 2013 (market recovery period) for more than 100 consumer floral purchasing metrics, as well as social media usage (e.g. Facebook, Twitter, etc) of floral buyers, and levels of consumer on-line floral purchasing made on a mobile device (both new metrics for the 2014 update). In addition, the P&P consumer floral tracking survey provides a comprehensive evaluation of the top 8 floral channels utilized by consumer households for floral purchasing (e.g. florist shops, supermarkets, super-discount stores, Internet/ national 800-numbers, home centers, wholesale clubs, farmers markets, garden centers, etc.) across more than 30 attribute measures. The P&P research also measures floral dollar purchasing, consumer satisfaction and future purchasing intentions at the various floral channels. Gain an understanding as to where the U.S. floral market is today, where it has been, and where it is likely headed! Please contact P&P for on-site seminar availability, options, seminar fees, and scheduling. For the 2014 update, Smithers-Oasis, N.A. was the key sponsor for the P&P consumer floral survey. Click HERE for the P&P Press Release. Prince & Prince (P&P) surveys florist shops in the greater Tampa, Florida market area to better understand the business needs of florist shops in the Tampa market, and how they are being served by local wholesalers and direct floral sources. For floral wholesalers and suppliers interested in this type of market information, please click on WHOLESALER RESEARCH for more information. Prince & Prince (P&P) release report, "Consumer Demographic Trends Lift Floral Purchasing for Easter" - - Insight from the Updated Prince & Prince Consumer Floral Research Seminar." Click HERE for the report. P&P welcomes comments from the floral industry on this report. Prince & Prince (P&P) release report, "Florists Upbeat on Future Prospects for Their Business". This report is a featured highlight from the recently-released P&P U.S. Retail Florist Tracking Survey (available from P&P as an on-site seminar, or as a "Seminar on CD"), which tracks numerous florist sales categories & financials, business operations, buying practices, product/ service offerings, and cut-flower/ potted plant/ gift-shop item usage trends from 2003 to 2005, and to 2010. Click HERE for the featured highlight. Prince & Prince (P&P) releases their updated market research of the U.S. retail florist industry. The updated P&P U.S. Retail Florist Tracking Survey, which tracks numerous florist sales categories & financials, business operations, buying practices, product/ service offerings, and cut-flower/ potted plant/ gift-shop item usage trends from 2003 to 2005, and to 2010 (survey conducted in the Spring of 2011) is now available as an On-Site Seminar, or as a "Florist Seminar on CD". This market research clearly reveals where the U.S. florist industry has been, where it is now, and where it is headed. Click HERE for more details. Prince & Prince (P&P) releases a new Market Report, "Consumer Floral Usage for “Home Decoration” Slumps in Recession, But Consumer Demographic Trends Signal a Re-Bound" - - Insight from the Updated Prince & Prince Consumer Floral Research Seminar." Click HERE for the report. P&P welcomes comments from the floral industry on this report. Prince & Prince (P&P) releases the updated "P&P US Consumer Floral Tracking Survey" (2010 Edition) in three presentation options: 1) Full-day, on-site seminar, 2) Half-Day (3 hour +) "Highlights Only" on-site seminar, and 3) "Seminar on CD" only (no on-site presentation). The on-site seminar options include a Q&A session, plus the complete seminar presentation on CD for future reference. The "Seminar on CD", containing over 800 slides of market information, is priced at $795 (US Dollars). Contact P&P for pricing information for the on-site seminar options. Prince & Prince (P&P) releases a new Market Report, "Trends in Consumer Floral Purchasing for Valentine’s Day in a Post-Recessionary Economy - - Insight from the Updated Prince & Prince Consumer Research Seminar." Click HERE for the report. P&P welcomes comments from the floral industry on this report. Prince & Prince recently presented their updated US consumer floral tracking research to three management teams of the Smithers-Oasis (S-O) Companies, North American operations (S-O Corporate, SONA, and Floralife, Inc.), the key sponsor of the P&P consumer research. The day-long seminar showed comprehensive historical data over the past decade that gave the S-O companies the ability to see significant changes in consumer demand for fresh cut flowers and potted plants, and the reasons for those trends (both consumer-based reasons, and retail channel-based reasons). With the approval of S-O, P&P will be offering seminars of the updated US consumer floral research to members of the floral industry, commencing in the Winter of 2011 and Spring of 2012. Interested parties should contact P&P for seminar scheduling, seminar fees, and approval status (S-O has full, exclusive rights to the P&P consumer floral research until June, 2012). . . Click HERE for more details. Prince & Prince presents exclusive floral market research, sponsored by Flowers Canada Growers, to grower members in Jordan, Ontario: "Assessing US Distribution Channel Perceptions of Canadian Floral Products". Highlights of this presentation will be given at the upcoming 2011 Canadian Greenhouse Conference, October 6th, at the Scotiabank Convention Center, Niagara Falls, Ontario. Prince & Prince launches a 2010 update of the P&P US Retail Florist Tracking Survey, assessing key trends in florist operations, product & service offerings, marketing tactics, financial performance, florists' future prospects, and the florist business strategies that currently lead to business success. . . . Click HERE for more details. Prince & Prince launches a 2010 update of the P&P US Consumer Floral Tracking Survey. . . Click HERE for more details. P&P releases a NEW Market Report, "The US Teenager Floral Market: Market Size & Scope, Purchasing Trends, and Teenager Priorities" . . . Click HERE for more details. Prince & Prince participates in upcoming WF&FSA Audio Conference, "Why Valentine's Day Is a "Recession Proof" Floral Holiday! . . . and with More Opportunities for Sales Growth!" . . . Tuesday, November 17th, 2009 at 3:00 pm EST. This audio conference is now available as a 50-slide P&P Market Report. Click HERE for more details. Prince & Prince Releases US Floral Industry Size Estimates for 2007 . . . click HERE for more details. Prince & Prince releases The US Consumer Floral Tracking Survey on CD! Click HERE for more information about this latest P&P "Seminar on CD" now available to members of the floral industry! Prince & Prince initiates new survey research about US wholesale florist operations for the Wholesale Florist and Florist Supplier Association (WF&FSA), "Profiling Wholesale Florist Operational Practices". Gardens America gains key insight on consumer floral trends, the changing priorities of consumers, and the dynamic channels of floral distribution. The sunny skies of Florida and the management teams at Gardens America provided Prince & Prince ( P&P ) a warm welcome recently in Miami. At the Hotel Sofitel Miami, P&P presented their updated consumer floral tracking seminar to the management & production teams of Gardens America. Lots of good questions . . . many insightful discussions . . . and a keen understanding of the latest consumer floral purchasing trends was had by all ( see details about the P&P Consumer Seminar ). Prince & Prince ( P&P ) recently presented their updated consumer floral seminar to the sales & management teams at the Paul Ecke Ranch in sunny Encinitas, California. As a "preamble" to the P&P presentation, Bob Williams, VP of Smithers-Oasis, N. A. (S-O), first described the background and context for S-O's support for the P&P research. The 6-hour seminar entitled, "The US Consumer Floral Tracking Survey", was well-received by the seminar participants, with plenty of questions about emerging consumer floral purchasing trends. There were also good discussions throughout the presentation, discussions that identified key implications for the Paul Ecke Ranch going forward. The "staff really enjoyed and got a lot from the presentations", said Andy Higgins, President of the Paul Ecke Ranch. The updated consumer floral seminar is based on P&P's periodic national surveys of US floral-buying households, conducted in 1996, 2000, and 2007. The seminar focuses on several key aspects of the US floral market: 1) Consumer Floral Purchasing Trends, 2) Floral Outlet Market Shares, 3) Floral Outlet Performances ( product & service strengths & weaknesses ), 4) Consumers' Satisfaction and Future Buying Intentions at each Outlet, 5) Consumers' Value Propositions & "Drivers" to Floral Purchasing Behavior, and 6) Demographic Profiles of Floral-Buying Consumers ( see details about the P&P Consumer Seminar ). Prince & Prince ( P&P ) presented two separate Power-Point presentations of their most recent florist research to WF&FSA members ( the Wholesale Florist and Florist Supplier Association ) on the evening of August 13th, 2008 at the Embassy Suites Hotel in Downtown, Cleveland, Ohio. Over 350 randomly-selected florist shops throughout the US responded to the P&P survey, providing a 4% margin of sampling error in the overall survey statistics. In one presentation, "Evaluating the Effectiveness of the WF&FSA Ad Campaign", the research findings clearly showed florists' awareness of the WF&FSA ad campaign ( both aided and unaided ad recall ), and florists' awareness of specific ad messages, including the new ad tagline: "It's in the details", as well as awareness of the overall WF&FSA ad tagline "Wholesalers: Because it takes more than flowers to grow your business". The P&P ad evaluation research also identified the impact of the WF&FSA ad campaign on florists' positive perceptions toward wholesale florists, and its impact on florist purchasing from wholesale florists. The P&P ad evaluation research will be used by the WF&FSA Marketing and Communications Committee to fine-tune the ad campaign, and to better target and improve upon the ad campaign's effectiveness. In a second presentation, "The Value of Wholesale Florists", P&P showed survey findings that track product, service, and image perceptions of floral wholesalers, as perceived by retail florists, in comparison with other cut-flower supply sources ( Miami or farm-direct sources, and key wire-service cut-flower programs ). The P&P research findings clearly revealed the recent changes in florists' perceptions toward wholesalers & their competitors, changes in florists' priorities, and changes in wholesale florists' overall market position. The research findings exemplify how wholesale florists are currently strongly valued by retail florists, and the findings reveal the key dynamics in that florist-industry valuation. In addition, the survey research provided WF&FSA valuable insight to more successful messaging for the WF&FSA ad campaign. Prince & Prince Surveys U.S. Retail Florists to Evaluate WF&FSA Ad Campaign, and to Assess Wholesale Florist Performance & Market Positioning. Prince & Prince recently completed the "data collection" phase of its nationwide survey of retail florists for WF&FSA ( the Wholesale Florist and Florist Supplier Association ). Over 350 randomly-selected florist shops throughout the US responded to the four-page mailed survey, providing a 4% margin of sampling error in the overall survey statistics. A key objective of the survey is to assess florists' awareness of the WF&FSA ad campaign ( awareness of specific ad messages and ad tagline: "It's in the details" ) and to determine how the WF&FSA ad campaign may influence florists' positive perceptions toward wholesale florists. Another key objective of the survey is to track product, service, and image perceptions of floral wholesalers, as perceived by retail florists, as well as determine the level of florists' cut-flower purchasing from local wholesale florists and other cut-flower supply sources ( Miami or farm-direct sources, and key wire-service cut-flower programs ). Comparisons will be made with survey statistics from the 2006 P&P/ WF&FSA florist survey to reveal recent changes in florists' perceptions toward wholesalers, and changes in wholesalers' market position. Survey highlights will be provided to WF&FSA members on the evening of August 13th, 2008 at the Embassy Suites Hotel Cleveland - Downtown, in Cleveland, Ohio. Prince & Prince research results from the US Consumer Floral Tracking Survey cited in PRNewswire release, "Arranged Flowers Continue to be a Staple for Mother's Day". Prince & Prince announces first information release from the new US Consumer Floral Tracking Survey, "Consumer Floral Purchasing Trends for Mother's Day"
Click HERE for more information about the new P&P Consumer Floral Research! Prince & Prince were recently invited to Indianapolis, IN to present their latest florist research findings to the "All-Committee" meeting prior to the 2006 WF&FSA (Wholesale Florist and Florist Supplier Association) Management Institute, August 17th - 19th, 2006. WF&FSA sponsored this new survey research of retail florists (365 florist respondents), randomly-selected throughout the US. The purpose of the research was to identify the key market-position strengths of wholesale florists nationwide (as perceived by florists) for fresh cut flowers and hardgoods/supplies, as well as identify the key priorities of florists when purchasing from their floral suppliers. The market research findings will be used to identify salient message themes for the WF&FSA Ad Campaign, as well as to assist floral wholesalers in gaining a better understanding of the perceptions and needs of retail florists. Prince & Prince offers a 3-hour on-site presentation of the complete market research, including a Q&A session, for individual WF&FSA members that have supported the Wholesaler Marketing Campaign. Interested WF&FSA members should contact Prince & Prince for scheduling and fees for this unique, on-site presentation, to get more out of the WF&FSA-sponsored market-positioning research. Prince & Prince were recently invited to San Francisco to make a customized "Trends" presentation to California growers and attending wholesale florists throughout the US at the 2006 Fun 'N Sun Convention, sponsored by the The California Association of Flower Growers & Shippers (CAFG&S). The presentation identified seven key trends emerging in the retail florist industry, and seven key trends emerging in the mass-market floral industry. Participants were challenged to embrace these emerging industry trends, and to define ways to capitalize on these changes. Selected market research findings provided in the presentation were excerpted from P&P's 2005 Florist Tracking Seminar, and P&P's 2003 Mass-Market Floral Buyer Seminar. At the Fun 'N Sun presentation, Prince & Prince announced that both seminars, currently offered as on-site presentations, will be released shortly as a "Seminar on CD" format. Click HERE for details about the CD's. The California Cut-Flower Commission (CCFC) has recently commissioned Prince & Prince, Inc. to update their California cut-flower production and marketing statistics through a state-wide survey of cut-flower/greens growers. The survey updates and expands upon prior Prince & Prince surveys of California cut-flower growers conducted in 1998, 2000, and in 2003 for CCFC. The production-tracking research provides valuable statistics on over 100 cut-flower/greens species produced within the state, and allows the California cut-flower industry to make more informed production and management decisions. Join the list of leading companies that have gained critical market knowledge of the US retail florist industry. This seminar covers florist industry trends across three key time periods (1998, 2003, and 2005), largely representing "Boom", "Bust", and "Recovery" periods of the US economy. The seminar is based on survey responses from 1,048 randomly-selected retail florists throughout the US in 2005, and extensive trend comparisons are made with the 2003 and 1998 P&P US Florist Tracking Research (each study with over 1,000 florist respondents). The seminar shows where the US florist industry has been, where it is now, and where it is likely headed. With the "Inter-Active" Power-Point seminar, participants can "drill down" on the topics of most interest to them. March 5, 2005 (Columbus, OH). The Prince & Prince (P&P) US Florist Tracking Research is progressing well. To date, over 950 randomly-selected retail florists throughout the United States have responded to the 2005 survey, and P&P continues to receive survey returns daily. This nationwide marketing research project tracks recent changes in the retail florists' product mix, cut-flower mix, and flower form mix, and identifies florist-usage trends for 65 cut-flower species, 20 potted plant species, and over 30 floral hardgood/gift-shop items. The P&P research also tracks changes in florist marketing practices, service offerings, shop operations, and florist financial performance. P&P is currently conducting targeted second-mailings of the florist survey to improve survey response for specific regional segments. P&P intends to keep the survey "response window" open through early Spring, and expects to obtain well over 1,000 florist respondents for the 2005 Tracking Research. Florists that have been selected to receive the survey are encouraged to complete it as soon as possible. The 1998 and 2003 florist surveys conducted by P&P had 1,007 and 1,012 florist respondents, respectively. P&P plans on releasing findings from the tracking research in the Summer/Fall of 2005 through its seminar offerings to companies in the floral and green plant industries, floral associations, and other interested parties. Prince & Prince is currently booking its seminars for the 2005 season. Please go to the web site and "Seminar" page at www.FloralMarketResearch.com for more information, or contact Prince & Prince, Inc., PO Box 2465, Columbus, OH 43216-2465; phone: 614-299-4050. November 10, 2004 (Columbus, OH). Prince & Prince (P&P) has announced that it will update its US Retail Florist Tracking Research in early 2005. This nationwide marketing research project tracks recent changes in the retail florist product mix and identifies florist-usage trends for 65 cut-flower species, 20 potted plant species, and over 30 floral hardgood/gift-shop items. The P&P research also tracks changes in florist marketing practices, service offerings, shop operations, and florist financial performance. P&P plans on releasing findings from the tracking research in the Summer/Fall of 2005 through its seminar offerings to floral associations, and reports and on-site seminars provided to interested parties. Prince & Prince is now booking its seminars for the 2005 season. Please go to the P&P web site at www.FloralMarketResearch.com for more information, or contact Prince & Prince, Inc., PO Box 2465, Columbus, OH 43216-2465; phone: 614-299-4050. Prince & Prince were recently invited to Ventura, California by the California Cut-Flower Commission (CCFC) to present their florist and mass-market buyer seminars to the cut-flower growers of the golden state. The two 4-hour+ seminars provided growers the latest trend information from the two 2003 Prince & Prince national market studies. The seminar format of the Power-point presentations provided the ideal setting for discussion among growers of the florist and mass-market business trends, crop usage trends, cut-flower sourcing trends, and revealing the key market opportunities for California cut-flowers. "Our growers benefited enormously from the information presented by Prince & Prince," said Kathryn Miele, director of marketing for the CCFC. "The tie-in from the florist and mass market studies to our own CCFC production survey was particularly insightful, and the information gleaned from the seminars will provide a solid foundation for growers to determine future marketing strategies for their companies." Both seminar presentations were simulcast on the Internet for maximum exposure and opportunity for CCFC growers throughout the state to participate. The "Interactive" presentation allowed the audience and on-line participants to "drill down" on the survey topics of most interest. 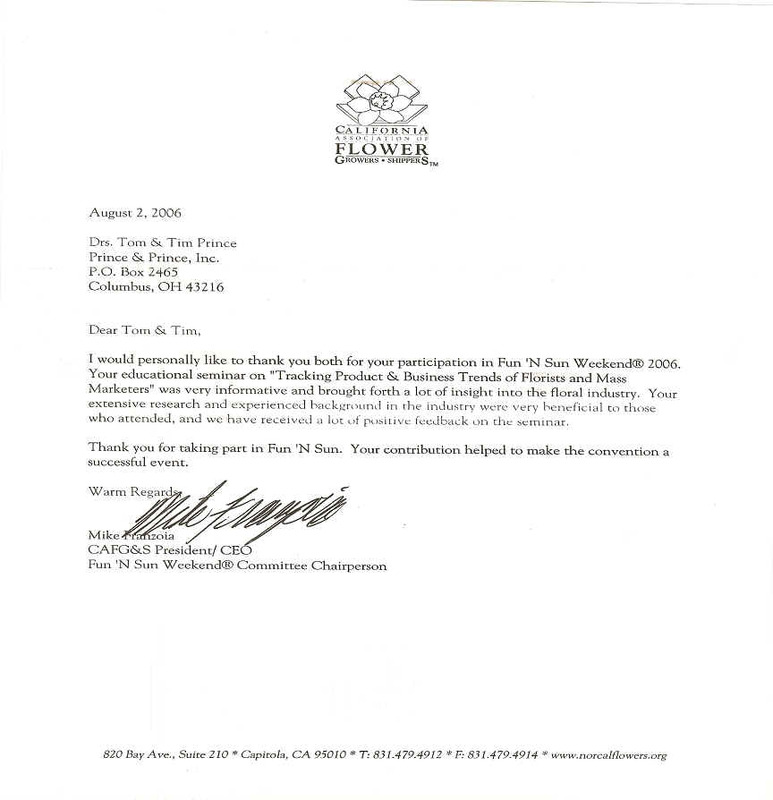 P&P offers to individual companies and floral associations seminar presentations of the 2003 retail florist and mass-market floral buyer research. The details of the market research are fully described on the Prince & Prince web site: www.FloralMarketResearch.com. Contact Prince & Prince for seminar options and pricing information at 614-299-4050, or e-mail at FloralMktResearch@att.net, or mail to: Prince & Prince, Inc., PO Box 2465, Columbus, OH 43216-2465. Prince & Prince, Inc. (P&P) presented their retail florist and mass-market floral buyer seminars to over 80 Flowers Canada members at the 2003 Annual General Meeting in Toronto, Canada, on Oct. 24th. The two Power-Point presentations, presented by Drs. Tom & Tim Prince, highlighted market findings from the updated P&P research reports, “Product, Service & Operational Trends of the US Retail Florist Industry” and “Trends in Mass-Market Floral Buying, Operations, Sourcing, and Merchandising.” The conference attendees, comprising Canadian floral growers, wholesalers, distributors, and retail florists received the latest trend information on florist and mass-market floral products, shop operations, marketing practices and service offerings, floral care & handling practices, and product sourcing. The presentations helped set the stage for subsequent strategy sessions positioning Flowers Canada toward a blossoming future. P&P offers to individual companies and floral associations seminar presentations on their updated retail florist and mass-market floral buyer research. The two research reports are fully described on the Prince & Prince web site: www.FloralMarketResearch.com. Contact Prince & Prince for seminar options and pricing information at 614-299-4050, or e-mail at FloralMktResearch@att.net, or mail to Prince & Prince, Inc., PO Box 2465, Columbus, OH 43216-2465. Prince & Prince, Inc. (Columbus, OH) has recently released its updated report about mass-market floral buyers. The 2003 report, "Trends in Mass-Market Floral Buying, Operations, Sourcing, and Merchandising" provides market trend information for floral buyers, floral executives, and all floral suppliers servicing the mass-market floral industry. The research report is based on survey findings of 90 US & Canadian mass-market floral buyers, representing floral purchasing for nearly 21,500 stores, with $3.3 billion in floral-product sales. Where possible, Prince & Prince make trend comparisons with their year 2000 and 1995 study findings, revealing the changing market behavior of the mass-market floral industry. The 20-chapter report encompasses 175 pages, including data tables and charts, with key findings fully summarized. The 2003 floral-buyer research was sponsored by The Super Floral Show, www.superfloralshow.com. The report reveals changes in the mass-market floral-product mix, and changes for specific types of floral operations. The report also profiles floral specialty sales (e.g. wedding, sympathy, wire order, local phone sales, business-to-business sales, and Internet sales), identifies effective information sources for finding new floral vendors, shows changes in buyer priorities towards floral vendor services, documents trends in floral sourcing for fresh cut flowers and bouquets, identifies "momentum" trends in floral product emphasis, business operations, and buyer marketing & merchandising emphasis. New for 2003, the report reveals key operational measures, including square footage allocated to floral, floral gross margins, labor cost percentages, floral as a percentage of total store sales, and the number of SKU's in eight floral categories. Also new for 2003, the report profiles floral care & handling practices regularly used in the mass-market floral operations. All study findings are segmented by type of operation, including chain supermarkets, independent supermarkets, grocery/service wholesalers, and other mass marketers (e.g. discounters, super-discounters, wholesale clubs, and home centers), as well as segmentation by number of stores, store service levels, buyer organizational level, and region. The report is a valuable resource for those wanting to know how to best operate in the mass-market floral industry today, and tomorrow. The 2003 mass-market floral buyer report is priced at $395. Prince & Prince Releases Updated U.S.
Columbus, OH, July 10, 2003 - Prince & Prince, Inc. has recently published its updated report about the retail florist industry in the United States. Entitled, "Product, Service, and Operational Trends of the US Retail Florist Industry", the 250+ page report provides a comprehensive statistical profile of florists' product mix, product usage trends, service offerings, purchasing practices, floral operations, competitive environment, and recent investments made by florists to improve the floral business. The 2003 research study was co-sponsored by the Wholesale Florist & Florist Supplier Association (WF&FSA), and all WF&FSA members receive a 50% discount off the published price of the report. The 2003 study makes numerous comparisons with the 1998 Prince & Prince florist study to identify key trends occurring in the US retail florist marketplace. All study findings and trends are presented for the US market overall, and segmented by ten Census regions, size of the florist business, urbanization level of the primary market served, and age of the florist shop owner. The segmented findings reveal the key florist market segments that lead or trail the overall US florist industry trends. For both the 2003 and 1998 studies, over 1,000 randomly-selected florist shops throughout the US participated in the survey research, and provided unbiased market information about their shop's product & service offerings, marketing practices, shop operations, and future intentions about their florist business. The report is available for sale from Prince & Prince by calling 614-299-4050. The report is fully described on the Prince & Prince web site, www.FloralMarketResearch.com, under "Reports for Sale" and "Details". BOSTON, April 7, 2003 – A special presentation based on the much anticipated 2003 Prince & Prince Study of Mass-Market Floral Buyers in the U.S. and Canada has been added to The Super Floral Show, on June 12, 2003 at the Salt Palace in Salt Lake City. This new report is funded by The Super Floral Show. • Comparison of selected results between the 2003 and 2000 studies. "Both buyers and suppliers will benefit greatly from this comprehensive study," said Don Berey, Show Director. "The Super Floral Show is very pleased to sponsor a study that will provide so much value to the industry." Berey added that this will be the first time the results of this study have been presented in person to an industry forum. "We are delighted that The Super Floral Show made it possible for us to update and enhance this critical study of mass-market floral buyers," said Tom Prince. "We are especially excited to have an opportunity to present research highlights at the industry’s leading Forum." The value of this report to mass market buyers was underscored by Tom Lavagetto, President of Floral Consulting Group, who said he has bought the last three reports and uses them extensively for strategic planning purposes. "It is one of the most valuable resources you can have as a mass-market floral buyer because it provides you with guidelines to determine where you are today and where you want to be tomorrow." The special presentation is open to all show attendees and a complimentary "Executive Summary" of the report will be provided to all session attendees. Copies of the study may be available for purchase at the show. This new session will enhance the industry’s most comprehensive conference program that features a stimulating keynote presentation on "What the 21st Century Customer Really Wants", an insightful General Session on "Complications, Expectations, Innovations: How the Floral Business is Changing", and four Roundtable sessions dealing with a variety of important topics. For more information on the conference or the show, or to discuss specific editorial opportunities, visit The Super Floral website at www.superfloralshow.com or call Roger Halligan or Chris Bauer at (312) 332-4650, ext. 22 or 23. The Super Floral Show is the leading trade exposition and conference for mass retailers, super markets, garden centers, retail florists and other retailers of floral products. It is held annually at alternating locations throughout North America. Admission to SFS is strictly enforced to maintain the integrity of the buying audience. All attendees at the show must sell directly to the end-customer. 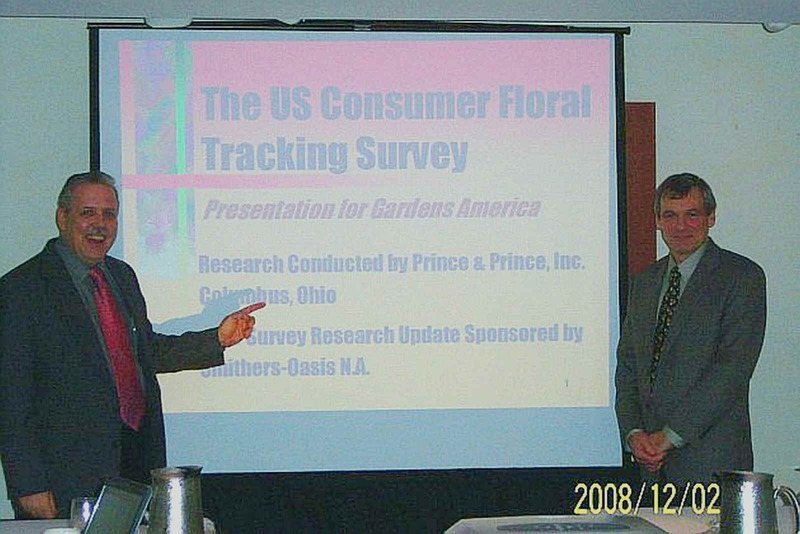 Prince & Prince, Inc. (Columbus, OH) has recently initiated its nationwide tracking study of retail florists for 2003. The marketing survey, "A Study of Product Mix, Services, & Operations of Retail Florists" was mailed to 5,000 randomly-selected retail florists throughout the US in early January. This marketing research updates and expands upon a 1998 Prince & Prince study of florists. The marketing research will show where the florist industry has been, where it is now, and where it is likely headed. For 2003, the marketing research is co-sponsored by the Wholesale Florist and Florist Suppliers Association (WF&FSA). Research highlights will be provided at the 2003 WF&FSA Convention in San Antonio, Texas on April 2-5, 2003. Prince & Prince will offer a comprehensive research report of survey findings this Summer. See "Reports for Sale" and "Details" on the Prince & Prince web site, www.FloralMarketResearch.com for a complete listing of report information. In addition, Prince & Prince will offer on-site, one-day presentations of the florist research to companies and industry associations commencing this Summer. Copyright © 2019 by Prince & Prince, Inc. All rights reserved.